Photo: Road, Transport and Bridges Minister Obaidul Quader talking to reporters before starting his journey for Tungipara from Shimuliaghat in Munshiganj on Wednesday, 09 January, 2019. 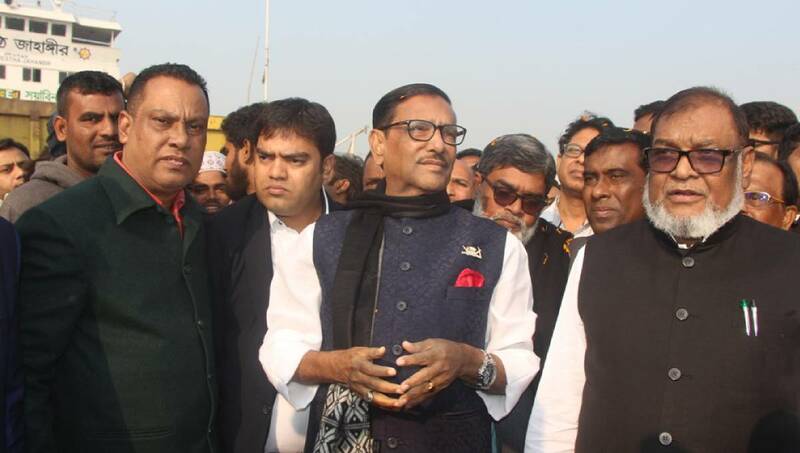 Munshiganj, Jan 9 : Road, Transport and Bridges Minister Obaidul Quader on Wednesday said nobody believes that those who faced defeat both in their movement and in election have anything new to do. The minister came up with the remark while talking to reporters before starting his journey for Tungipara from Shimuliaghat in Munshiganj around 9:30 am. “They failed to wage any movement for 10 minutes in the last 10 years. What will they do now? If they wage any movement politically, we’ll respond to it politically,” he said. Prime Minister Sheikh Hasina, accompanied by her cabinet colleagues and senior Awami League leaders, went to Tungipara today and paid homage to Father of the Nation Bangabandhu Sheikh Mujibur Rahman marking the installation of her government for the third consecutive term.